What would Frank Sullivan Say? So the interwebs have been abuzz in the past 48 hours regarding New York Times columnist Ross Douthat’s op-ed on Sunday entitled “The Plot to Change Catholicism.” Commentators have questioned Douthat’s faith, frankly (and unfairly) blamed some of his ideas on the fact that he is a convert to the Catholic Church, and compared him to Dan Brown. That’s a lot. And there’s a lot to say about what I might consider the errors in the column – the importation of a U.S.-style conspiracy theory into the reading of Vatican politics, an analysis of the current synod far too based on conservative hearsay than on knowledge of the actual conversations, an arrogant clarity with regard to theological truth that even the most confident apologetics teacher might shy away from. We tend to avoid such finely tuned distinctions in contemporary theology, not out of a lack of respect for truth, but out of humility in front of our task, and concern about the modernist, propositionalist attempt to systematize the world of the faith into an airtight box. But Sullivan’s work maintains the importance of distinguishing what is taught, by whom, and with what intended response, not out of a relativist desire to undermine the truth, but in order to defend the truth through clarity regarding how the magisterium of the church teaches it. Pope Francis’s homilies at the Casa Santa Marta are not infallible teaching; nor are encyclical letters to be dismissed as equivalent to off-the-cuff remarks in an airplane press conference. It used to be the case that the collapse of these distinctions into a single category called “doctrine” or “church teaching,” or the extension of a penumbra of infallibility to every papal statement was the calumny of Protestant critics of the Catholic Church; with Douthat’s column, we see just how pervasive is a kind of magisterial fundamentalism in which the faith is always clear and in which the quality of irreformability attaches to each statement in the Catechism of the Catholic Church regardless of origin, context, or teaching authority. Douthat reflects the end product of a long process in which the careful distinctions of centuries past have run together into a single category called “doctrine” or “church teaching.” Again, it was Fr. Sullivan who first warned of this in his critiques of the Catechism’s leveling effect, and the way in which the decontextualization of Catholic teaching from its sources in the Catechism raised the danger of all magisterial teaching being equally important, equally authoritative, equally irreformable – and, dangerously, equally open to dismissal or unbelief if any one teaching no longer seemed probable, rational, or credible in the fullest sense. Distinctions of magisterial authority and doctrinal teaching, therefore, are not an attempt to weasel out of the hard truths of the Gospel, nor a capitulation to modern relativism – they preceded that phenomenon and will long outlast it. Rather, they are an attempt by the church to be clear about the limits of human theological knowledge, or, more positively, about the freedom that Christ gave his church to deepen in its knowledge of the truth under the guidance of the Spirit. Douthat may even be correct in his conviction that such a change would lead the church into error. As lay Catholics and not synodal Fathers, that is neither my, nor his, wheelhouse. 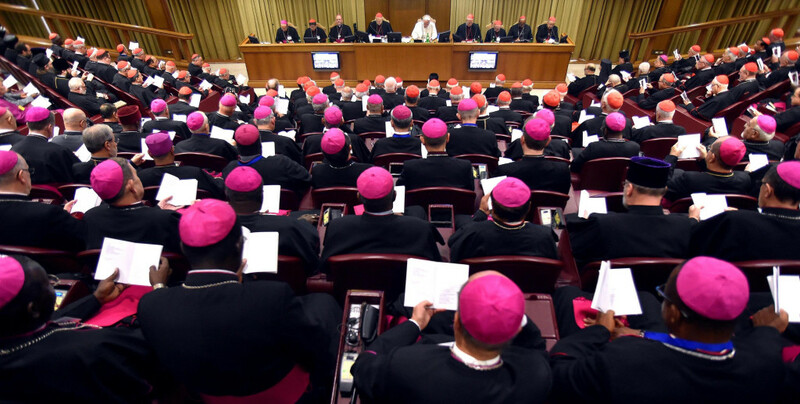 But a change in the church’s teaching on an issue not infallibly taught, including the changes in pastoral practice in relation to divorced and remarried Catholics some bishops have suggested, need not threaten one’s belief in the teaching authority of the Catholic Church, unless one understands magisterium as a brittle, rigid defense mechanism called “church teaching” rather than the flexible skeleton of the Body of Christ. Douthat’s critics should stop that! It’s uncharitable to Dan Brown. It bewilders me that a journal of the New York Times’ stature solicits opinion from a columnist of Ross Doodad’s stature. We are not talking about particular interventions of the Magisterium. We are talking about crystal clear things that are part of the “constant and very firm” teaching of the Church, as J. C. Ford, sj would say, that is, the universal, ordinary magisterium. Crystal clear in Sacred Scriptures. Since (willful) unrepentant adulterers will not enter the Kingdom of Heaven, how can they rightly receive the Bread come down from Heaven? Because mortal sin requires clear and certain knowledge of the gravity of the sin. These are often people who feel in all conscience that their first marriage was not a covenanted one. This is very well done – but still probably a bit complicated for folks who have not done a basic study of the magisterium and the degrees of authority in church teaching. This is one of the best things written on this subject and thanks for it. I suspect though that Ross Douthet would hold that core elements of the theology of the Eucharist, which were indirectly being debated at th Synod, were of the highest signifcance and have been part of those “theologically certain” areas of doctine you mentioned. The issue then is to debate whether he’s right or wrong on this. The letter critiquing the New York times for letting someone without a PhD in Theology offer opinion pieces on matters, including some on religion, was utterly disasterous and has done our discipline a diservice.